Hello my friends! 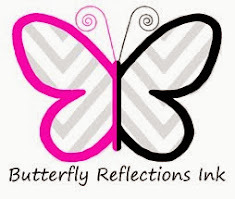 Thank you for joining me, Janette, here on the Butterfly Reflections Ink blog. I hope that this Father's Day finds you well and that you are celebrating those that you love. Fathers come in all shapes and sizes, and aren't necessarily always the biological pops. Be sure to celebrate all those who have taken on the fatherhood role out of necessity, compassion or simply for the love of the children. Sometimes that looks like a single mom, grandparent, uncle or even a friend or neighbor. It takes a village to raise these children, and it is important to let those people know they are appreciated. 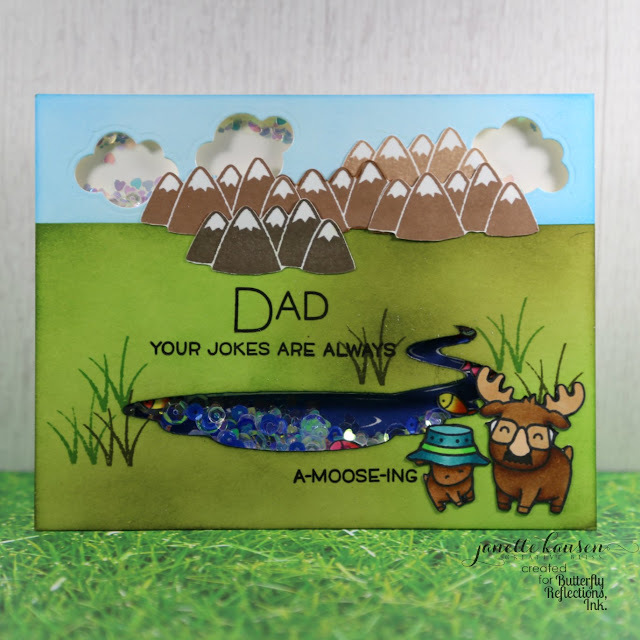 I share with you the card that goes to the awesome dad in our house, it's a-moose-ing! By now you must know that this girl loves a shaker. This card, with 4 shaker areas, was a breeze to make with the Misti Tool. 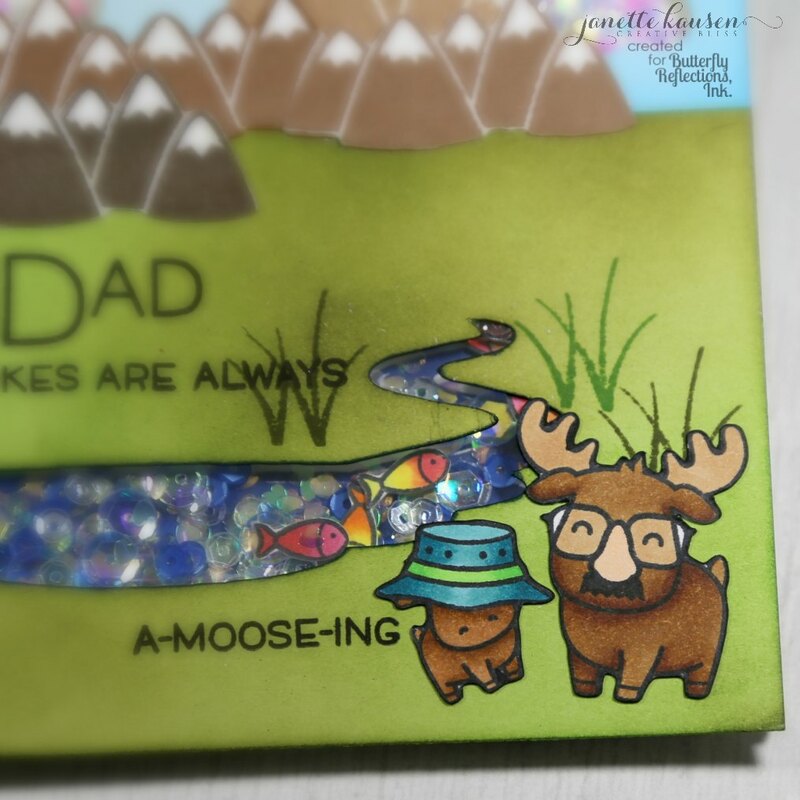 I stamped the pond and stream identically on two 4 1/4" x 5 1/2" white cardstock panels with the Dad & Me Lawn Fawn stamps (which is on sale now!). Set a panel for the back aside. Use coordinating dies to remove pond or fussy cut. Stamp hills with Lawn Fawn ink in Walnut and Doe. Remember that you can have a greater range of color with one ink by double stamping the image twice over itself for a darker image or stamping first on scratch paper and then without reinking stamping on your card panel for a lighter image. Next, ink blend the sky with Tumbled Glass and Salty Ocean Distress Inks. Do the same with Mowed Lawn and Forest Moss for the grass. Stamp a few sprigs of grass for added interest. Die cut tiny clouds with Lawn Fawn Simple Puffy Clouds Lawn Cuts. Stamp and color the moose with chosen accessories. I used Copic markers in E95, E33, E35, E37, E29, BG09, BG57, FYG2 and YG06. Assemble card by attaching images to front and acetate to back of main panel. Add two layers of double sided foam tape and sequins to your back panel with the prestamped pond. Carefully line up your main panel with the pond in the background and there you have made yourself a shaker card! This stamp set is great for Father's Day, but can be used year round. The accessories are just hilarious. Of course there is the little fish, but a mustache, funny glasses, a hat - so stinkin cute! Head on over to the BRI shop now to get yours! Have a fabulous day my virtual friends! Like the shaker style card with the scene & whimsy. Have a Bee-utiful day! what a clever way to use a shaker feature! !